The Infant Optics DXR-8 Video Baby Monitor is the first-ever baby monitor made with an interchangeable optical lens capability. This feature allows you to customize the viewing angle and zoom. The display is LCD and is 3.5 inches of full color screen. The compact unit comes with a retractable antenna with sound-activated LED display. Other features include a remote pan, tilt, and digital zoom. The battery life is 10 hours on power-saving mode, or 6 hours with the screen on. An optical zoom lens is included. A wide angle lens is sold separately. Other features include an invisible IR night vision, alarm function, scan mode (requires add-on cameras), two-way talk, and a remote temperature display. This monitor can be expandable up to 4 cameras. The Infant Optics DZR-Video Baby Monitor weighs 1.8 pounds. The dimensions are 19.3 x 13.4 x 6.5. As of this writing the Infant Optics DXR-8 Video Baby Monitor had 13,620 reviews and 830 answered questions on Amazon. I've read through the reviews and answered questions to find the most talked about topics and then condensed the results into this report. I hope that this helps you to decide if this baby monitor might be one that you'd like to purchase. "We've had this monitor less than a year and we've already had to replace the battery. The plug doesn't stay in the monitor very well either. The biggest issue is that recently the monitor won't go to "sleep" when we push the "sleep" button unless we do it really hard. Not sure what the deal is with this monitor. I'm wondering if we just got a bad one." "Durability has started to become an issue after one year. The video starting getting a little crazy (very bright and washed out at times) and eventually the entire screen died. However, after only one phone call customer service made the exception to replace the monitor even though the warranty had recently expired. This prompted me to write a review about the negative and positive. I don't think there are any perfect options for high quality, fancy extras, durable video monitors. Just like many things nowadays, expect them to break and hopefully you have good customer service to fix the problem." Parents were not complaining about the price. Most who commented on the price, felt like it was a fair price for what they got.
" This camera and monitor are great and the customer service provided by the company is outstanding. 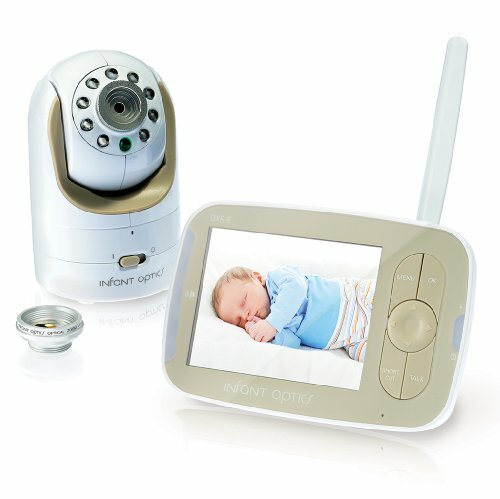 So stop hunting and trying to weigh all the baby camera/monitor reviews and get this camera and monitor if it provides you with all the features you want. You really aren't going to find anything better. We initially purchased this camera and monitor after spending way too much time pouring over all the options available to us, trying to find the BEST camera and monitor for our new baby. Our main concerns were getting a good camera with quality night imaging, good sound, and a easily viewable monitor. We also felt we didn't want a system that sent our image feed off to some remote server where it would be stored for some period of time for whatever analytics that the company performed. The Infant Optics DXR-8 fulfilled all our wishes." Many of the parents liked that they could keep an eye on their baby full time with this monitor. But there was a reoccurring topic of the monitor frequently losing signal. Some parents felt like it was not a safe monitor if it would lose signal so often. Also, when it lost signal, it would beep and wake up the parents. The beeping sound is actually a safety feature that lets the parent know that the monitor lost signal. However, parents found the beeping annoying, especially when they were trying to sleep. "It's so frustrating at night. Why? Because this thing loses signal for no apparent reason even though she's just in the other room. It quickly reconnects, but it lets out the most obnoxious beep which wakes me up multiple times in the middle of the night! The last thing a mom of a new baby needs is to be awoken to stupid beeping! I thought there might be interference, so I modified a whole bunch of settings on our wireless router, moved it away from metal objects, etc. Nothing worked. I called their customer service hoping there was a way to just turn off the beeping. The woman I spoke to said it's a safety feature that can't be turned off." "When you need reliability, this won’t consistently give it. Worse, our older version beeps incessantly when it loses connection and you can’t turn it off. Here’s the kicker: we bought it in March 2015, and although the site says that you can turn off the beeping on all orders since March 2015, ours doesn’t have that feature." The Infant Optics DXR-8 Video Baby Monitor has some of the best baby monitor features on the market. When it is working well, parents really liked this monitor. However, the durability and longevity of this monitor are questionable. Also, many parents said that it loses its signal too often and lets out a beeping noise when it does. The beeping noise is a safety feature that is supposed to alert the parent that the monitor lost it's signal. And it does seem to be doing just that. However, the beeping sound wakes tired parents too often. On a good note, the customer service seems very good with this company. I hope that this review helps you as you look to purchase the right baby monitor for your family.